Fourth Grade Nothing: I Saw E.T. 14 Times - IN THE THEATER! Remember when you were a kid, if you liked a movie, you had to see it over and over again. If you didn't, you weren't a true fan. You'd memorize every single line and could easily recite the script along with your friends. What happened to those days? Why doesn't this matter to most of us anymore? I think back to the films I saw in the theater. Often it was summer cinema when school was out and movies were like $4 and popcorn was like $2 - and we thought that was pricey back then. Our moms would get rid of us for a few hours. Back then it was safe to just get dropped off at Sunrise Cinemas on Sunrise Highway. Today, not so much. We'd brag about how many times we saw our favorite film. In my case, this was especially true for E.T., Karate Kid, Goonies and Footloose. Ironically, I had crushes on the lead kid in every movie from Henry Thomas to Ralph (he was from LI and we shared the same b'day!) to Sean Astin (I had an inhaler like his character Mikey!) and Footloose - Kevin Bacon - wow! Thanks to Footloose, I discovered hair mousse. I had read in Seventeen magazine about this brand new hair product called "mousse," you cold manipulate your hair to appear spiky, just like Wren's in Footloose! For Christmas of 1982, I had to have an E.T. sleeping bag, sheets and bedding, snack tray, posters, figurines, the board game, cup and plate set, and much more. I still have some of those items. I loved them all so much. I remember counting all of my E.T. things, writing them down in a notebook and admiring them all for days over the holiday break from school. I loved The Goonies more than any of my friends to the point where I even slipped a mini tape recorder into the theater with me. I recorded the audio and listened to it repeatedly for days and days until I had every line down pat, "...This is my dream, my wish, and it didn't come true, so I'm takin' 'em back, I'm takin' 'em all back!" I remember Corey Feldman's lines like it was yesterday. Too bad I didn't have a memory like that when it came to science and history. I'd be a top scholar! As an adult, the only film I've seen an excessive amount of times would have to be Rushmore. I know pretty much every line, own the soundtrack and DVD, and I still laugh at all of the same scenes. By the fall, I still loved ET and my mom threw me an ET Halloween birthday party complete with her best shot at an ET shaped cake. I dressed up like Gertie did on Halloween and went as a cowgirl. I am so happy that I found your blog! Sometimes I feel like I'm the only one wanting to go down memory lane! I can't remember which movie I saw first and whether it was Annie or E.T., but I loved them both and can recite almost any scene from the movie verbatim. I'm old and I loved them all! Especially ET! We have a little, talking figure of him around here, somewhere. I only saw it in the cinema/theatre once but I remember it being quite an event. My mum's best friend (who was American and didn't do things by halves) arranged a whole day event - we had our picture taken with ET, went to the shops to buy ET related merchandise (I remember Mum didn't actually buy US anything), and I think there was some kind of picnic involved. I was always scared of ET. That guy creeps me out. I memorised most of the lines to The Lion King. I think I watched it 14+ times on video. These days I have most of the lines to Dr Horrible memorised. I watch a new or different movie every day. I think I've been a netflix member since 1994. Yikes! before that it was Blockbuster. before that another place. I never lost that search for those movies that I want to watch again and again. memorizing all the lines. OK, so they are no longer movies about horses or whatnot, but there are some obsessive-worthy movies still out there for us aging folks! I saw Star Wars probably 30 or 40 times (not ALL at the theater) and once had most of the script memorized, by carpet-cleaning buddy and I (from the job I had in 1977) used to recite lines back and forth to each other, accents and all. We could even tell from the music what scene was on. Your post reminds me of the time I took my godson to see E.T.--it had just come out and he desperately wanted to see it and his mom was working 2 jobs, so..... I am NOT good around more than one child and sitting there waiting for the movie to begin with a theater full of hyped up kids gave a new meaning to the word TORTURE--but then the lights went down, the letters "E.T." filled the screen, and the exact same sound came floating from every little mouth: "eeeeeeeeeee teeeeeeeee". Silence. And then of course they all started yelling and laughing and jumping out of their seats and I was in hell again. We wore our VHS of E.T out playing it so much! I love the photo of your birthday party. Friends of our family saw Grease 15 or 16 times in the theater. I saw a few movies twice -one was Indiana Jones and the Last Crusade. best pictures EVER!!! 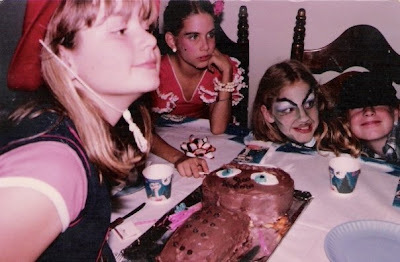 i LOVE that ET cake and you dressed up like Gerdie! TOO freakin cute!!!! i like ET too... however i am the absolute WORST at trying to remember lines from any movie... even movies i like.... there is very limited space up in the brain.... i try to store and file the important dates and stuff. =( i wish i had a wonderful memory like that.... then this history class i'm taking wouldn't be so difficult!! i saw your 2 difficult courses were science and history.... probably mine as well... what were your favorite/best? Confession: I've never seen E.T. My parents' first date was to go see it, and they have it on VHS now. Somehow, I've avoided it. E.T. just creeped the hell out of me. I remember memorizing the lines to every movie and reciting them with my brother and friends at recess. Why don't kids do that anymore? Sad. What's awesome is that we loved ET also, and now we've got the DVD for the kids and they love it too!! Love the idea of the birthday party based on ET AND you were adorable in that cowgirl hat!! I was literally just thinking about this the other day - not E.T. specifically, but the days before VHS where you could go see movies over and over because they didn't cost an arm and a leg. Sigh. You dressed up like Gertie? I love it! I thought it was sad. I like Teenage Mutant Ninja Turtles!!!! Saw it at the drive in when I was LITTLE bitty. As an adult, the movie I've seen the most often has got to be a tie between "Dirty Dancing" and "Grumpy Old Men". Great Post. I remember watching the first Indiana Jones in the theatre with my teacher!. That was the time when students and teachers could actually interact without fearing prosecution. Footloose was my very favorite. I used to try to dance along with Kevin Bacon when I would watch it on VHS. And I had the soundtrack on tape. That's when my mom realized that dance lessons were pretty much lost on me. I wasa little scared of ET, so we had a love/hate relationship. ScoMan, me too! He terrified me! ET scared the crap out of me. The part where he got sick and went white? I had a dream after watching the movie that ET was at the foot of my bed eating my socks and it was traumatizing. I got sick every time we planned to see ET :-(. I finally saw it at age 17!!!! 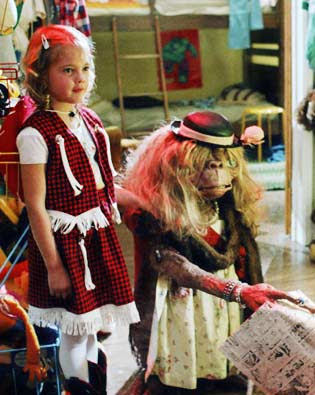 my first movie I ever saw in theaters, was Annie, the second was either ET or Empire strikes back. That was a pretty cool party. The cake looks great. did you see Ashley's (King) ET video? omg your gertie costume is sooooo cute! i had ET sheets too. it was the first movie i saw in the theatre (I was 5). it made me cry at the end when ET went back home and had to leave Elliot.